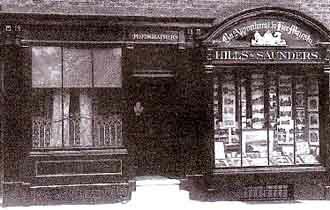 Hills & Saunders, Harrow Branch, kept a day book to record their customer's name and the negative number for re-order purposes and similar information was also recorded on the negative glass plate. From a careful examination of the Negatives 30,600 entries have been made (recorded by a M.S.C. Scheme, 1990s). So for each record listed here a photographic negative plate will still exist. Most of the 6 x 4 inch (and a few larger) glass negatives have survived, though many are in need of care and conservation. For the 30,000 records scroll down this page where they are listed. All the records have been sorted into numerical order. This list may enable you to find the name of the sitter from the number written on the back of the photograph. The records with two dates are a Harrow schoolboy's leaving photograph (leavers) or Masters, others are of local people who used the studio, or record they local views and events. The same information (as above) has been sorted into alphabetical order, this puts family photographs together, and makes finding a person easier. MISC Miscellaneous larger photographs in box order. If you are interested in these photographs you should contact Harrowphotos Not Roger Vaughan.